Terrace with a Stunning View! If you’re doing it right, coming home should be the best part of your day and the comfort and joy of a home that reflects your personality are beyond compare. The team at HBA London, had this in mind during the creation of Aranya Pavillion in Mumbai, a world-class experience centre in an old mill compound in Byculla. Bordered by 60 acres of botanical gardens on one side and the Mumbai harbour on the other, you’re guaranteed a room with a view. 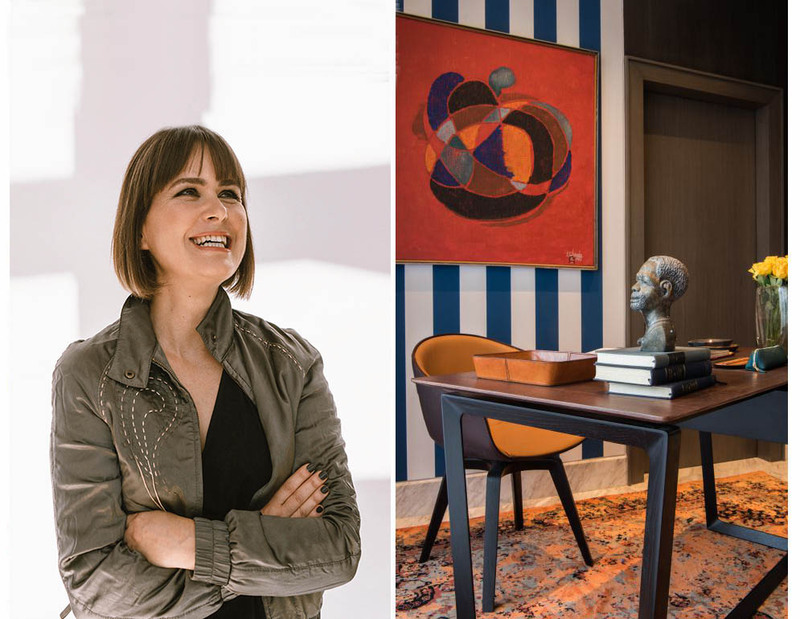 Creative Director of HBA, Constantina Tsoutsikou and leader of the Aranya design team describes the project as ‘An exceptional marketing showcase, one that is intended to inspire visitors.’ The historic locale and proximity to the botanical gardens gave them a launchpad for the design process and became the focal points of the structure. Entering The Pavillion is an orchestrated experience where you glide effortlessly between meticulously curated spaces. The reception lobby greets you with light stone and green onyx wall features that radiate opulence. 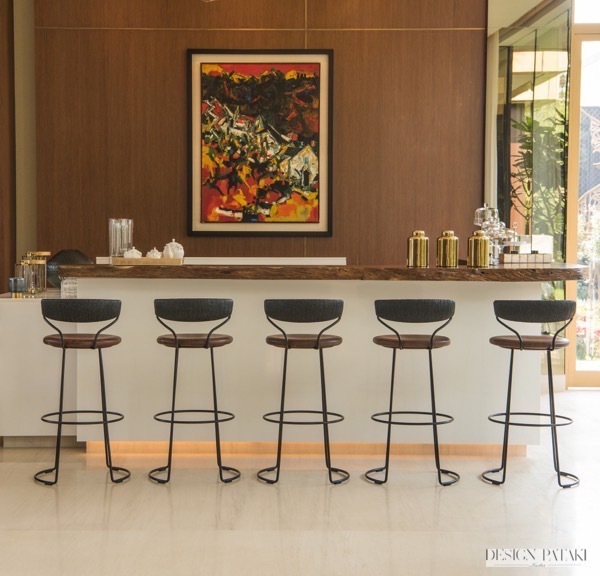 Two handpicked East Indian walnut tree trunks usher you in to the bar in the Cafe Lounge. The theme continues with a three-metre long, raw edge bar top. ‘We were lucky enough to find a workshop just a short walk from the site that had hundreds of wood species to choose from.’ Says Constantina ‘By looking closely at grains, character and movement, we were able to hand select the pieces that were right for Aranya. For me, this experience truly epitomises the joy of designing in India.’ Similar organic elements are seen in the light fixtures, accessories and earthenware that reflect the verdant greenery of the surroundings. The Dining Area with a Rich Artefact Shelf flanking on one side. 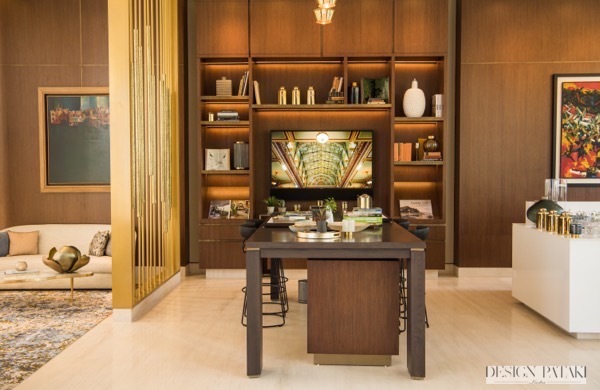 Through the show apartment, we see highlights of the same ethos, at the entrance with a ginkgo leaf sculpture echoes through the passageway where the white Volakas marble flooring is offset by gold inlay and contrasting statement rugs. The study is a sophisticated space in hues of burnt sienna and navy blue. Moving to the kitchen you find quartz countertop, fluted glass and burnished brass cabinets with deep wood fittings. Across the board, they worked with the elements to harness the potential of natural light throughout the day which is best seen in the living and dining room. Here, the contemporary open plan and the elements of nature, with silk panels depicting jungle scenes lead out to a spacious private terrace. 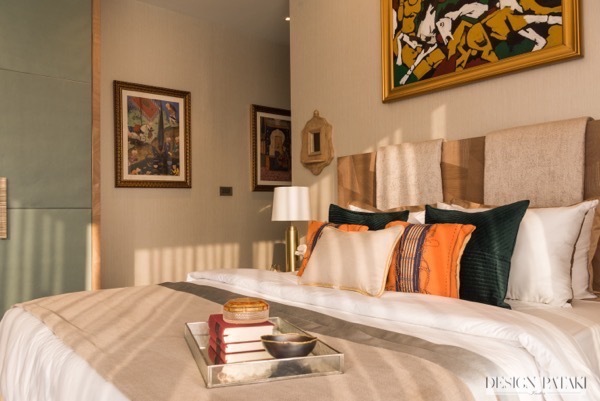 The master bedroom, deputy master bedroom and third double bedroom all come with en-suite bathrooms and though all are equally enchanting, they each come with their own unique colour signature. Deputy Master Bedroom in pistachio and a pop of saffron. 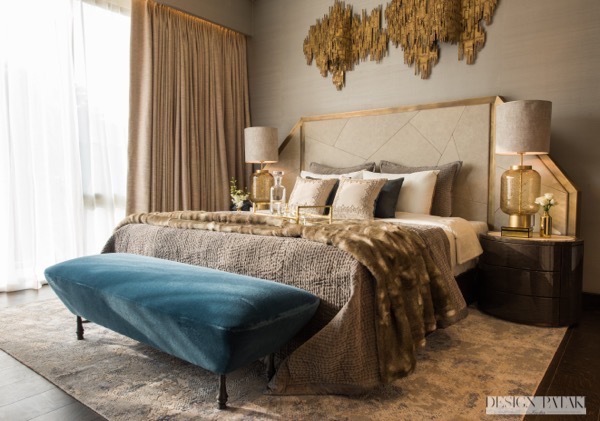 The undercurrent of nature flows through the house in the Master Bedroom. In the midst of a metropolis, a space as peaceful as Aranya is a rarity. But Constantina believes that finding that balance is essential. She believes that “Aranya will set a benchmark for luxury developments in Mumbai and internationally, showing how city dwellers’ lives can be bettered through connection with nature and open green public spaces.” It is indeed a huge step towards ensuring a better quality of living in a city that so rarely stops to smell the roses. Next article10 hottest coffee table books for 2018!